Let's just get this out of the way: I don't do orange. It's just never worked very well with my hair, and I've always stayed clear of it. However, when my new favorite online boutique, Everything Darling, offered to send me this polka dot frock, I couldn't resist. I decided that it was time that orange and I set aside our differences and give this friendship another shot. And what do you know? I love this dress. 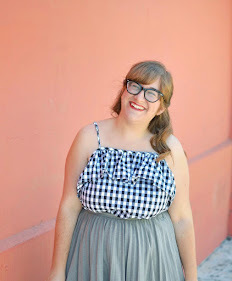 It's fun, it's flattering, it's well-made, and it's polka dotted — basically everything I look for in a dress. I still felt that it didn't work too well with my hair, so I tried to put some distance between my hair and the dress with a denim jacket and a scarf. And voila, an orange piece exists in my closet that I plan to get plenty of wear out of. As you all know, I'm a huge supporter of small businesses. I try my best to use my blog to promote them as much as I can, but I decided that I wanted to do a little bit more. Starting now, whenever I write a post that highlights a small business, I'll be including a Q+A with the people behind the shops so you can get to know those who work so hard to bring you the unique items that you see. Today, I'm incredibly happy to start off my "Let's Chat" series with Natalie and Grace, who the women behind Everything Darling. Natalie & Grace: Grace moved out here 7 1/2 years ago from New Jersey and was invited to a party by a friend. Natalie (a California native) noticed Grace did not really know anyone and struck up a conversation. We became instant friends, discussing how and where we grew up only to find out we were living blocks from one another. The rest is history.We became best friends, roommates and now business partners. How and when did the idea for Everything Darling start? It was something we had both been thinking of for awhile. With Grace's degree in business management and desire to start her own business and Natalies degree in fashion merchandising it just seemed like the perfect time. We both have a strong love for fashion and a good background to build on so we worked hard and created Everything Darling. What is your favorite part about running an online boutique? We are involved in every aspect of the business. From the time its picked out to the time it is shipped out. We put our personal touch on all that you see. Because of this we are able to personalize everything and really enjoy creative freedom down to the packaging. To be honest we get so involved we often forget how to turn off the business side of things. It is something we think most business owners struggle with. Finding a good balance of work and a personal life. How would you describe the Everything Darling girl? We like to think of our Darlings as fun, feminine, creative, inspiring, and adventourous. The type of girl that will put on a dress, but isn't afraid to get it dirty. What is one thing about Everything Darling that sets it apart from other boutiques? We develop personal relationships with our customers and future customers. It doesnt end with an order. You guys inspire us too. We wanna know how our Darlings style our garments and accessories whether through social media or stopping by to say hi at a pop up shop. We like to engage on all levels we want you to love what your are wearing as much as we loved picking it out. Lastly, are there any exciting plans for the future of Everything Darling that my readers can look forward to? We have a lot of exciting things in the works for 2014, but one thing in particular we feel your readers will be excited about is our Darling of the month. Starting soon, we will pick one "Darling" who will be featured on our social media plus given some goodies. You will just have to follow a long and see. Thanks so much to Natalie and Grace for talking to me and for the adorable dress. If you loved learning more about Everything Darling as much as I did, make sure to check out the store, plus find it on Facebook, Twitter, Instagram, and Pinterest. Loved the interview! You really need to do orange more often! :D I think it looks magnificent on you. The scarf is a great addition too! Fun new series. Also, you look cute in that. I like the statement necklace paired with it too. Aw, that dress is wonderful! I love the long sleeve and the orange looks great on you! This dress is so great! You look awesome in orange, but if you for some reason decide you don't like orange on you, I'd gladly take this cute frock off your hands! I tried to check out the shop to see what other cute stuff they had in store but their server is down! Dang! I'll have to check back later! I love this! This is a great way to find new or new-to-me small businesses! Really, really wonderful! That dress is absolutely darling (get it?)! No, but really burnt orange is lovely color on you! I love the fact that you are not only wearing the super cute dress from the shop, but also that you included this interview. I loved reading more about their shop! Great idea including interviews with small businesses that you support! I've always thought the same thing about orange and my hair! But this colour looks fantastic on you! And I love that you brought out the blue dots with your necklace and jacket. Love the interview, and I agree with everyone else - such a great way to show support! This outfit is perfection! I love the dress on you! Seems like a really cute shop. Oh my goodness, that dress is so adorable! I love longer sleeves on dresses and the pattern is so perfect!